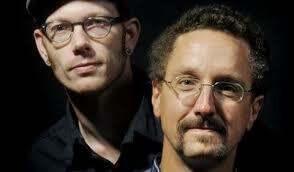 Adam Hammer and Dave Cofell are no strangers to taking the spotlight solo with their infectious songs and stories. But when the two team up to split the bill, something incredible happens. Somewhere along the line between Hammer’s intricate finger-style guitar playing and fluid lyrics, and Cofell’s heartfelt vocals and folky blues style, two acoustic worlds collide. The result is often unexpected and always memorable. The duo was voted Best Original Music in the St. Cloud Times’ annual Best of Central Minnesota reader’s poll four straight years in 2014, 2013, 2012 and 2011. Both of their 2012 solo releases, “Broken Like You” and “No Substitute (For You),” have spent time in the top 10 of the CMJ charts at 88.1FM KVSC in St. Cloud. Hammer has lived a life well beyond his years and it all comes through in song. His story is one of fatherhood, homelessness, love, addiction, recovery, pain, comfort and unity told in front of a backdrop of his own unique style of “tattooed folk” – melodic acoustic music, highlighted by an indescribable aggression.